It is hard to define "why" we become so enamored with something like Star Trek. Maybe it was the action and adventure of a story well told. Maybe it was because we found a "connection" with the characters. Maybe it was because it was all wrapped up in neat looking spaceship, hurtling through the galaxy. And maybe, it was all of the above. Gene Roddenberry wanted to create a series that portrayed "moral dramas" but set them into the furthest reaches of our imagination. He wanted to create a program that conveyed a hopeful future for mankind. He wanted "Wagon Train to the Stars." There are volumes upon volumes written about the Star Trek phenomenon today, and all of us likely have our favorites, clutched upon our respective bookshelves. But for me, it was the Star Trek Technical Manuals which really caught my attention. The drawings of designer Matt Jefferies, illustrating the complete inner details of the original Enterprise, along with all of the other devices seen on the TV series that were used on the ship, helped to increase the sense of "reality" to the show. Over the years, I built quite a few Star Trek models, most all of them made by AMT, who had the contract at that time to manufacture them. The Enterprise, the Klingon ship and the Shuttle craft "Galileo" are the ones I remember. Except, I can't remember what happened to them. 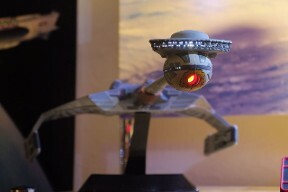 After the release of "Star Trek - The Motion Picture," my interest in Trek was renewed, and as soon as AMT released their re-fit Enterprise, I built one up. This time, we were a lot older and more detail conscious in our approach. Although the concept of "azteking," placing the sheet metal patterns onto the hull, was not a known article yet, I did my best to replicate the colors, as I saw them in the film. The lit interior windows were the biggest challenge. I decided at that time to use plastic "fiber-optic" strands, borrowed from inexpensive lighting kits, and run the stands for each set of window bays down to a common 6-Volt "grain-of-wheat" light bulb. The windows were opened up using a "pin vise" drill. The round windows took one strand each, while the oval shaped windows used three strands each. A very light touch with a butane lighter to the ends of the strands created a "lens" - a slight round bubble on the end where the light would emanate from. Then the strands were pulled in tight and cemented into place. The results were quite good. Unfortunately, the photos of that kit are quite old, and not very detailed. I kept my Enterprise for quite some time, but when we decided to move from our home in Peoria to start a new job in Chicago, the apartment would have limited room for such things. I donated a number of my larger models to the Lakeview Museum Planetarium in Peoria, as the Director was a good friend and I knew the models would be well looked after and serve valued purposes. This is were regret sets in. Years later, we are in Fox Lake, with more room and I really wanted to re-do an Enterprise, except maybe doing the job better than last time. The culmination of that desire found the Polar Lights 1/350 scale Re-Fit Enterprise and a pre-designed LED lighting system for the model done by VooDoo FX in California. Polar Lights furnished the azteking decals for the ship, so I did not need to buy them separately. The project took some five moths to complete. 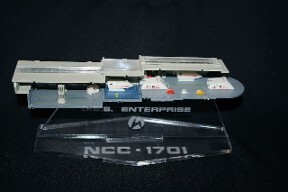 The Shuttle bay from the Polar Lights is also its own independent model, using a special display stand obtained from the Starship Modeler's Store on-line. That big Enterprise really stirred the Star Trek juices again. I have also recently re-done an original AMT TOS Enterprise, as well as an AMT Klingon D-7 Battle Cruiser, with a "simplified" version of LED interior lighting in its forward hull. 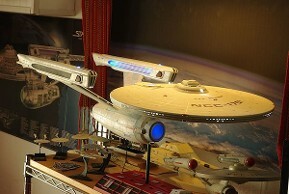 Please visit StarShipModeler.com for reference information and actual photos of the movie models of the Enterprise and other Star Trek craft accessible there.